I bought a new Sony Vaio S series laptop. It uses Insyde H2O BIOS EFI, and trying to install Linux on it is driving me crazy. What is surprising is that there are 2 EFI system partitions on the disk. The sda2 partition is a 20gb recovery partition which loads windows with a basic recovery interface. This is accessible by pressing the "ASSIST" button as opposed to the normal power button. I presume that the sda1 EFI System Partition (ESP) loads into this recovery. The sda3 ESP has more fleshed out entries for Microsoft Windows, which actually goes into Windows 7 (as confirmed by bcdedit.exe on Windows). Ubuntu is installed on sda6, and while installation I chose sda3 as my boot partition. The installer correctly created a sda3/EFI/ubuntu/grubx64.efi application. root@kubuntu:~# efibootmgr --create --gpt --disk /dev/sda --part 3 --write-signature --label "GRUB2" --loader "\\EFI\\ubuntu\\grubx64.efi"
However, on rebooting, as you guessed, the machine rebooted directly back into Windows. Overwrite /EFI/Boot/bootx64.efi and /EFI/Microsoft/Boot/bootmgfw.efi with grubx64.efi [but this seems really radical]. Can anyone please help me out? Thanks -- any help is greatly appreciated, as this issue is driving me crazy! I was eventually able to solve this. I replaced the EFI/Microsoft/boot/bootmgfw.efi with the grub64.efi. I renamed the former to bootmgfw.efi.old and used grub to add a menu option to chainload into it. This implies that the firmware is hardcoded to look for the microsoft windows bootloader, and does not respect efibootmgr settings, or startup.nsh. That's really terrible. Look in /EFI/Microsoft/Boot/fwbootmgr.efi; if present, boot it. Look in all sub-directories of /EFI/ for grubx64.efi. If present, boot it. Display an error message, such as "Operating System not found". Under Linux, the efibootmgr tool does work, but it displays a lot of auto-generated nonsense, including the last USB drive you've used. I opened up my new machine and collapsed the Windows partition in order to install Linux and Mac side by side. 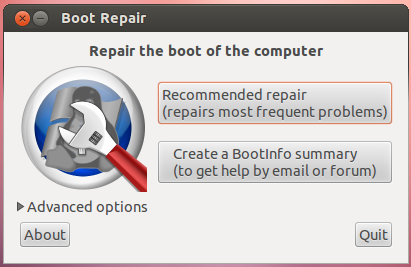 I installed Ubuntu 12.10 and the installer overwrote fwbootmgr.efi, backing up the old Windows bootloader. I restored the old Windows bootloader, but couldn't boot anything except Windows. I renamed the Windows bootloader to something bogus, and then the Grub BL took over. I renamed the ubuntu directory to something else, and Grub still loaded, even though I had install rEFInd. Move fwbootmgr.efi to its parent directory; rEFInd will still find it, and Windows won't complain that you renamed it. Rename grubx64.efi to rfgrubx64.efi or something else recognizable. Copy rEFInd from /EFI/refind to /EFI/boot, rename /EFI/refind_x64.efi to *.bak, and lastly rename /Boot/refind_x64.efi to bootx64.efi. You should now be able to boot the Windows BL or GRUB from rEFInd. I plan to upgrade my MacOS install to Clover, and load Clover from rEFInd as well. First, you don't have two ESPs. An ESP is a partition with a partition type code of C12A7328-F81F-11D2-BA4B-00A0C93EC93B, which parted identifies as a partition with its "boot flag" set. Your output indicates that only /dev/sda3 has its "boot flag" set, so you've got only one ESP -- /dev/sda3. Under GPT, partitions can have names, and you've got two partitions with the name "EFI system partition," but these names are used for human identification purposes only. Thus, my guess is that you (or some automatic utility) created a /dev/sda1 with the intent of making it an ESP, but either there was an error in setting its partition type code or some other utility improperly changed its type code from C12A7328-F81F-11D2-BA4B-00A0C93EC93B to something else. There are a number of ways you can correct this. The simplest is to just change the name of /dev/sda1 to avoid confusion. If you think that /dev/sda1 serves no purpose, you could back it up and delete it. This will get it out of the way and avoid confusion, but of course you'll then have 273 MB of unused disk space. Alternatively, you could devote the space to some other purpose, if necessary changing the name and type code to avoid confusion. EFI explicitly allows multiple ESPs, so you could change the type code (by setting the "boot flag" using parted, for instance) and use both ESPs; but this could be confusing. It could be you've mistyped something in your efibootmgr command. I don't see any obvious typos, but if the GRUB binary isn't located where you've specified, the command won't work. The "--gpt" and "--write-signature" options are almost certainly unnecessary, and could conceivably be causing problems, but most likely aren't. Your firmware could have a bug that's causing the efibootmgr command's effects to be temporary. Try rebooting and then type "sudo efibootmgr -v" to see if the entry you created has survived a reboot. Your firmware could have a bug that's causing the boot order variable to be ignored. I've got a motherboard like that; it boots in the order in which the boot entries are created, rather than the order in which they're specified by the BootOrder variable. To work around this bug, you would have to delete all the entries and re-create them in the boot order you want to use. Your grubx64.efi binary could be damaged in such a way that the firmware refuses to launch it, and so it goes on to the next item in the boot order. Delete all the boot entries using efibootmgr or your firmware (if it provides an interface to do this). Copy grubx64.efi to EFI/Boot/bootx64.efi on the ESP. If when you reboot you still get Windows, rename EFI/Microsoft/Boot/bootmgfw.efi to EFI/Microsoft/bootmgfw.efi. Alternatively, you could install rEFIt or rEFInd as EFI/Boot/bootx64.efi. Note that the rEFIt binaries available from its site won't work on UEFI-based PCs; you'll need to use the version in the Ubuntu repositories. rEFInd is a fork of rEFIt with numerous bug fixes and updates, including better UEFI support. (rEFIt seems to have been abandoned about two years ago.) Thus, I recommend using rEFInd rather than rEFIt -- but I'm rEFInd's maintainer, so I'm not an independent observer on this score. Unfortunately, AFAIK rEFInd isn't (yet) included in the Ubuntu repositories, so you'll have to download and install it manually. Same starting position here on a new sony vaio e series. Thanks Rod for your answer. Installed ubuntu 12.04 from USB alongside win7. Click the Recommended Repair button. (this will automatically install correct parameters for grub-efi, including SecureBoot parameters if needed, and renaming the EFI files in case the UEFI firmware is locked to Windows files). Indicate the URL that will appear if any problem. Not the answer you're looking for? Browse other questions tagged grub2 uefi sony or ask your own question. How to boot into Live USB/CD with UEFI on latest Vaio S series? Booting into Ubuntu without Grub? How do I dual boot Ubuntu 11.10 and Windows 7 with EFI?